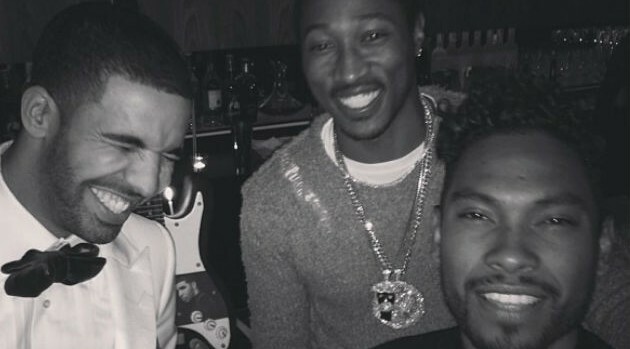 Courtesy of Drake’s InstagramDrake spent his 27th birthday with good company. The rapper, who was recently named the ambassador for the NBA’s Toronto Raptors, posted images on Instagram of himself en route to catch a game at the Air Canada Centre. Shortly after, the rapper made an outfit change, donning a white dinner jacket and burgundy bow tie. He then posted a black-and-white image of himself partying alongside his Would You Like a Tour mates Miguel and Future, the latter of whom Drizzy reportedly kicked off the bill then re-instated before the tour opener kicked off. Miguel and Drake have birthdays within days of one another, and despite some guy who “dropped all our bday shots on the floor,” it seems Drizzy had a great time. He also revealed a picture of his birthday cake, which seemed to capture all-things-Canada, including a Toronto Raptors mascot, a replica of Shoppers Drug Mart, his “Started from the Bottom” billboard, as well as the city’s CN Tower, among other things. Fans can catch Drake next when his North American outing pulls into the Prudential Center in Newark, New Jersey on October 27.